English Language and Comprehension is one of the vital section in every examination to grasp a government job. Without this section, anyone hardly can go through the Aptitude tests. English Language section is integrated part of every Aptitude test in India and contains equal weightage as other sections. It is also an essential to crack SSC and UPSC exams. It carries more weightage in SSC examination like CGL and CPO exams where 200 marks of English Language and Comprehension Test is conducted in Mains examination. Therefore, preparing this section is as important as preparing the other sections for the exams. I have earlier blogged about the list of English Language books for perceptive of Competition exams and those preparing for the Government jobs. Also Read: List of English Books for Government Job exams. To avoid confusion which book is best, which books to buy, etc. I here to review on few books which i personally refer and eminent among other aspirants. - This book has compiled the concepts and English language errors which one usually do in everyday. This book has followed the competitive exams pattern and reliable to read for those who want to start from the scratch. This book will provide chapters on Part-of-speech topics of English language with Hindi explanation and also has exercises at the end of every chapter to polish what you had studied. - If you have enrolled for coaching classes of Government job exams or for SSC CGL and LDC exams, you must have heard this book. This book is quite eminent among the aspirants. 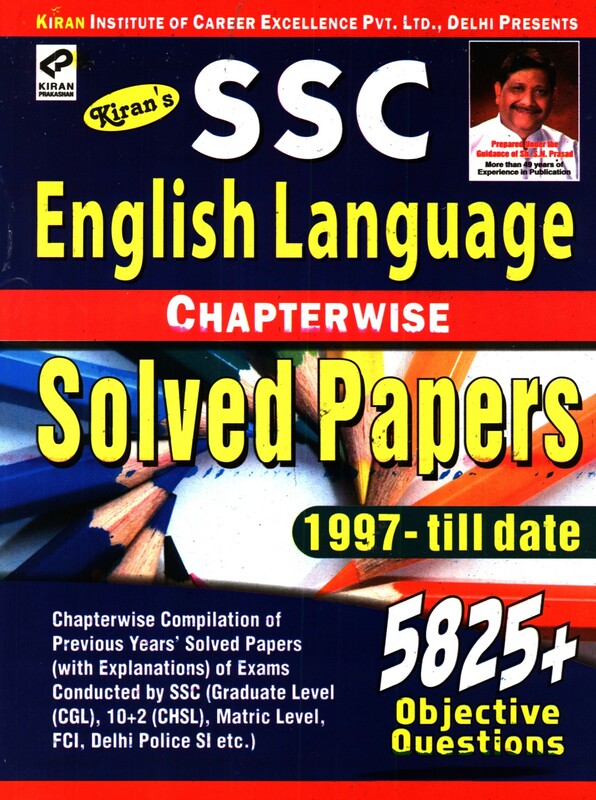 It follows the exact pattern and syllabus of SSC and other exams with explanation of every chapter in dual languages and also compiled the various topics such as synonyms-antonyms, idioms/phrases, one word substitution need to learn for the exams. So, one need not worry about the vocabulary and other useful stuffs to prepare from different books. You can buy this single book, if want to cover up the syllabus in short time. This book is good for beginners seeking syllabus and pattern of English Language section for SSC exams. - After reading and learning all concepts, it's equally essential to practice and polish your concepts. For this purpose only, Ajay K. Singh's book by M B Publications is one of the best. It includes all papers of SSC exams of last 4-5 years. There are over 100+ papers of SSC previous exams with answer keys which can be practiced to polish your concepts and speed. It also helps you analyze your weak zones. This also be noticed that answer keys are not always correct. You have to apply your concepts and logic in few cases where answer of the question looks wrong. This book contains not only previous paper, but also idioms/phrases, one-word substitution, vocabulary. But, the meaning of each is mentioned in Hindi language which can be subtle sometimes for the learner of English medium. - This book is also prominent and valued while practcing for the SSC exams.It consists of compiled previous year SSC questions. It also consists of concepts and error finding rules and other useful stuffs, if you are reading them first time. Otherwise, you can directly switch to chapter-wise previous year questions from each sections. It has compiled all the questions perfectly from each topic asked in English section that help student on each and every topics of English Section. Like, Fill up topic has 200-300 questions which are asked in previous years. Similarly, it has compiled all other topics such as synonyms, antonyms, narration, active-passive voice, etc. Practice is a part and parcel of every exam preparation. For this you need a good book to test and polish your preparation. Thus, i recommend English Tier-2 Mock test by Paramount publications which covers 20 mock test with good level of difficult questions which can testify your preparation and how much you can score in these tests. Before exam, daily practice take these mock test to sure your success in examination. Comments "Review of English Language Books for SSC Government Job exams"